"Need another way to use green tomatoes? Puree them and heat with sugar and fruit flavored gelatin (use your favorite flavor!) and you've got freezer jam." In a large saucepan over medium-high heat combine tomato pulp and sugar; bring to a boil. Reduce heat and simmer for 20 minutes, stirring occasionally. Remove from the heat and stir in the gelatin mix. Stir until the gelatin is completely dissolved. Pour into hot sterilized jars and seal. When jars are cool put them in the freezer. I made this recipe using sugar-free cherry gelatin and Splenda. It was very good. Had the ladies at work sample without telling them the ingredients---they were pleasantly surprised. MY grandma used to make this. I used raspberry jell-o. It suprisingly good, we use it on toast and bagles the kids love it. 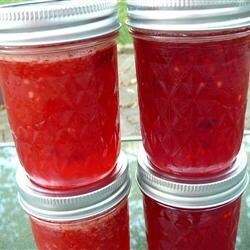 This jam is great! A very pleasant surprise! Try it if you have some green tomatos - you won't be sorry. Delicious. Perfect use of too many end of season green tomatoes. I used the called for amount of sugar, but used sugar-free gelatin....perfect. Absolutely delicious!